Back in the 1970’s, when I was 10 years old, my dad and his second wife, along with her two kids all moved into a house together. The house was in a pretty rundown part of town that was not far from Dearborn in Michigan. From the very first time I stepped into that house I knew it wasn’t right. Dad and I were in the house together, just a few days before we moved in. Dad was measuring the place up and we were working out where the furniture would go. I was hanging around in the bathroom on the lower level and dad was in the garage. I heard knocking on the wall and it seemed to be coming from the kitchen. I thought it was Dad—but when I called out asking if anyone was there Dad called back from the garage. Later the doorbell rang when nobody was near it, we disconnected the wiring and it would STILL ring. In the end we became used to the strange doorbell. A number of things happened often in that basement. First, the light in the closet would turn on and off by itself. Dad would always get on our cases about leaving it on until one day, when no one else was home, he turned it off only to find it back on again. 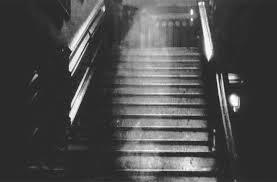 We would frequently hear footsteps going down the stairs, only to never go back up. These one way stair trips would go on all night. Stamping feet would just go down the stairs randomly. Sometimes stopping in the middle, but never returning to the top. That was one weird house—we left about a year later, and I never missed the place. A very haunted house was submitted by Anon.